I was watching the new season of Top Gear the other day...and...oh...wait, its not called Top Gear anymore, it is now called the Grand Tour...anyway...I was watching the new season of show with the three British auto journalists who spend most of the show ridiculing each other (nice chaps...) and I said to myself; "self, you haven't posted many British cars recently". Let's rectify that with a short wheelbase Rover in British Racing Green. 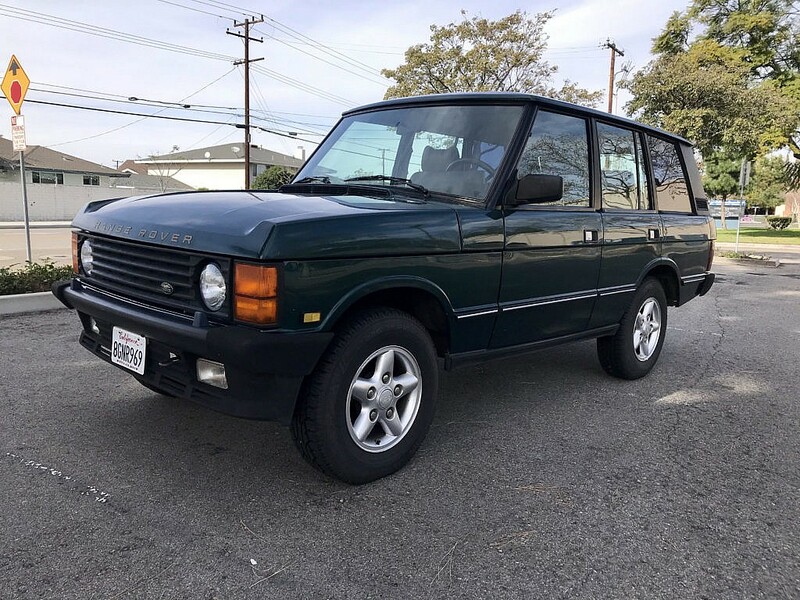 Find this 1994 Range Rover Classic bidding for $6,500 with 3 days to go, located in California via SecondDaily.com. Tip from Stephen. Second Daily is proud to present this 1994 Range Rover Classic County SWB. It is finished in British Racing Green over Sorrel Tan Connolly leather with just over 144k miles. Being a short wheel base version, power comes from a 3.9L V8 mated to an automatic transmission. 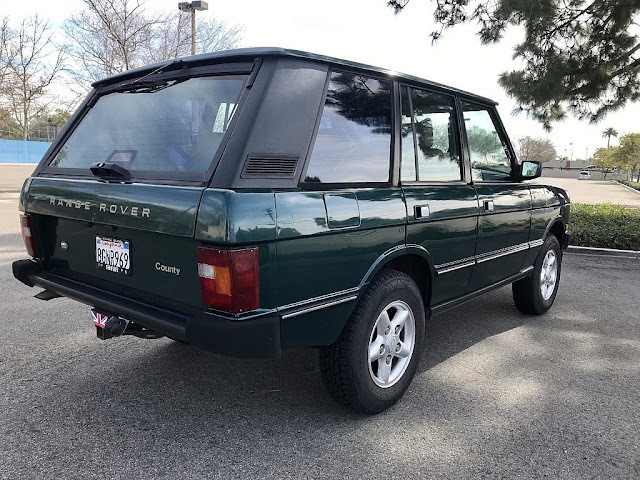 Located in sunny California, the body presents in overall excellent condition, with only very minor surface rust on a small area of the inner tailgate and hatch, and some surface spots on the front floor pan. Nothing of any significance but we can’t legally say 100% rust free. The seller has provided excellent photos of the typical spots and all areas look great. It reportedly runs and drives great and is mechanically nearly perfect. With the exception of the original radio, almost everything works including the windows, AC/heat, power seats and cruise control. The ABS/traction control lights illuminated for a rear wheel speed sensor. This is a complete original running driving vehicle that passes CA smog…and it even still has the original rear ‘HOLD’ tabs and tonneau cover. Nice!! Thanks for posting guys ... nothing more British than a range rover classic in British Racing Green! For those not as much in the know, the SWB short-wheel base trucks came stock with the 5-spoke TWR (Tom Walkinshaw Racing) wheels shown here...very much a sought after item in the Rover underworld. This one is all original...not many left on the road are. Thanks DT!! Years ago, in a previous life, my ex and I drove one of these from Houston to Aspen for her boss. It was a dog with horrible gas mileage, but was butter smooth on the road, felt like a tank and was incredibly capable in the snow. That upper crust, British feel came in spades. You couldn't pay me to drive a Range Rover. I drove a Discovery on loan for a few months while my A8 was being ministered to, and the thing was a death trap. A gust of wind would flip the wipers backwards from the windshield, it wouldn't atart, rattled like an old taxi, got appalling gas mileage, and on and on. To this day, I can't believe they still sell these things, let alone at the prices they get for them. I hear ya. My ex also had a '95 Disco as a company car. Surprisingly, I don't recall it ever having many issues, but geez was it a pig... 185 hp for a 4500+ lb. vehicle made for quite the lackadaisical driving experience. My experience has been a little less apocalyptic than yours, Second, but I’ve only had my p38 for a couple months. I got it for this featured car’s current bid and the thing is pretty cool. Feels solid, airy and open. The EAS is in good working order and the interior all works. I’d of course heard of RR propensity for failures both spectacular and indolent, but the curiosity got the better of me so I found one while they are at their apparent value nadir.